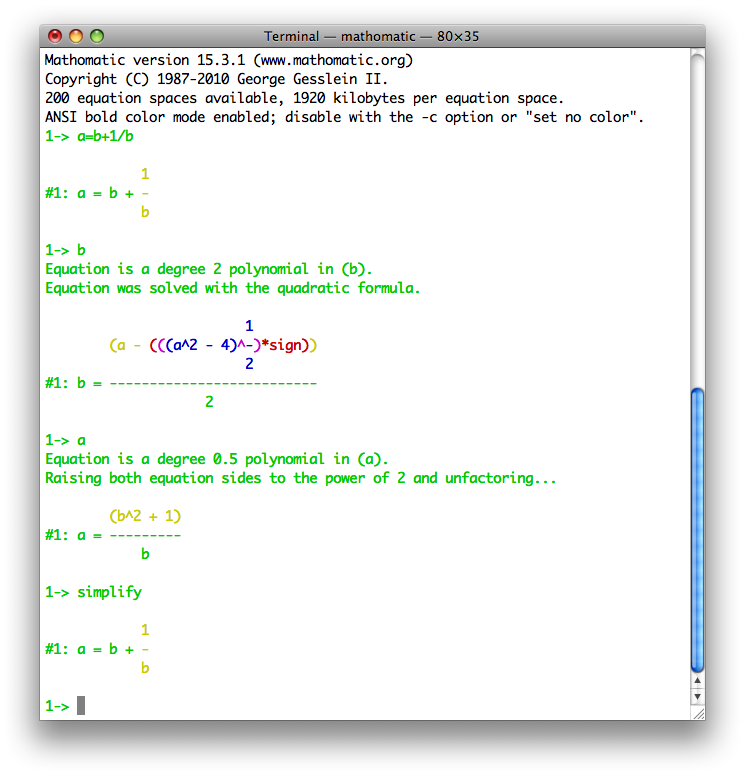 Mathomatic for Mac is a portable, command-line computer algebra system (CAS) written entirely in the C programming language. It is free and open source software, published under the GNU Lesser General Public License. The software can automatically solve, differentiate, simplify, combine, and compare algebraic equations, perform complex number and polynomial arithmetic, etc. It does some calculus and is very easy to compile, learn, and use. A portable, command-line computer algebra system (CAS) written entirely. Mathomatic consists of a text-mode, floating-point and symbolic math application and library, and integer math utilities that all compile and run under any operating system with a C compiler, including Linux, Unix, and Mac OS X. There are no dependencies other than the standard C libraries. The mathematical results should always be correct, simple, beautiful, and as documented; if not, please report it on the Mathomatic project site on Launchpad.net, or you can email the author for a quick response. * The symbolic math library has stabilized, with all known problems and shortcomings fixed. * Plots and graphs with Gnuplot are now customizable. * Most commands are automatic and some are repeatable with the repeat command. * Integer variables are now specified by using a variable name that starts with "integer". Qweas is providing links to Mathomatic for Mac 15.3.4 as a courtesy, and makes no representations regarding Mathomatic for Mac or any other applications or any information related thereto. Any questions, complaints or claims regarding this application Mathomatic for Mac 15.3.4 must be directed to the appropriate software vendor. You may click the publisher link of Mathomatic for Mac on the top of this page to get more details about the vendor.